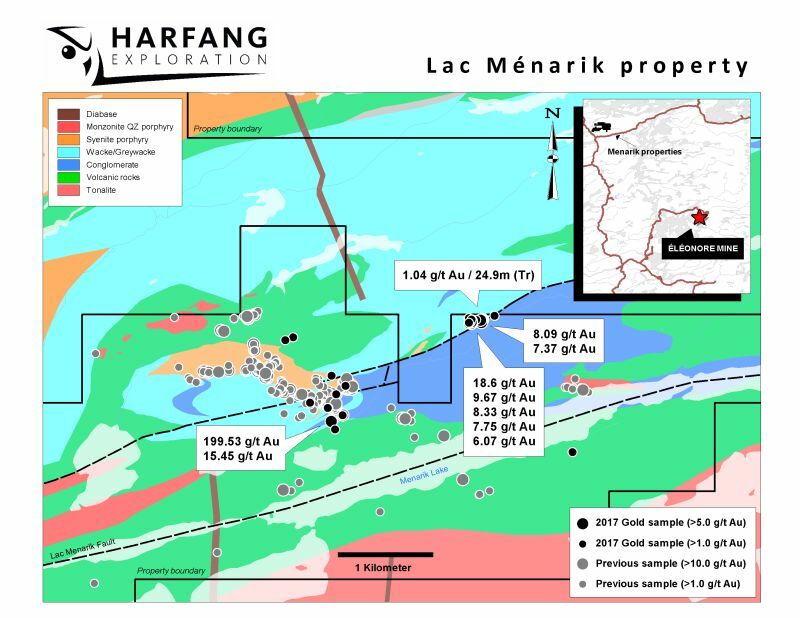 MONTREAL, QUEBEC–(Marketwired – Nov. 8, 2017) – Harfang Exploration inc. (“Harfang“) (TSX VENTURE:HAR) is pleased to announce the results of its 2017 summer exploration campaign on the Lake Menarik and Menarik East properties located in the La Grande geological subprovince, James Bay area, Québec. Both properties are 100% owned by Harfang Exploration and are located <50 km south from the Radisson village. Channel sampling carried out on the newly discovered Greco showing exposed on the Menarik Lake property revealed a value of 1.04 g/t Au over 24.9 m. From a total of 347 collected from the property, 41 grab samples yielded an average gold value of 3.72 g/t Au if we exclude one extremely high value (199.53 g/t), providing a range of 1.06 to 18.60 g/t Au (Figure 1). Table 1. Significant Au (> 1 g/t) assay values returned from the Menarik Lake property. Note that grab samples are selective by nature and values reported may not be representative of mineralized zones. On the Menarik East property, channel samples collected from two sites yielded: 0.3 g/t Au and 13.26 g/t Ag, 0.91 wt. % Cu and 0.95 wt. % Zn over 3.9 m (Yvan II showing) and 2.17 g/t Au over 2.9 m (Bonspot showing). A total of 287 grab samples were collected from the property, most of them from sheared tonalite outcrops. The polymetallic mineralization is contained within chalcopyrite (Cu), sphalerite (Zn), galena (Pb), pyrite/pyrrhotite and arsenopyrite (Au). A significant proportion of samples present base metal values > 1 %and/or Au values > 1 g/t (Figure 2). Table 2. Significant base metals (>1%) and Au (> 1 g/t) assay values returned from the Menarik East property. The first exploration step consisted of line cutting (59.55 km) to conduct IP/resistivity geophysical surveys (41.65 km) on both properties revealing distinct geological settings. Moreover, the surveys showed the gold bearing structures to be principally associated with marginal to moderate chargeability anomalies, commonly associated with resistivity increases. The summer period was further devolved to detailed and regional geological mapping accompanied by grab sampling and channel sampling on specific showings where significant base metals and gold values were found (i.e.Greco, Yvan-II, Bonspot and Beaver). Mineralization is associated with ENE-WSW brittle/ductile structures aligned with gold-bearing veins on the Lake Menarik property and with a network of faults and/or shears oriented NNW-SSE defining important deformations corridors on the Menarik East property. 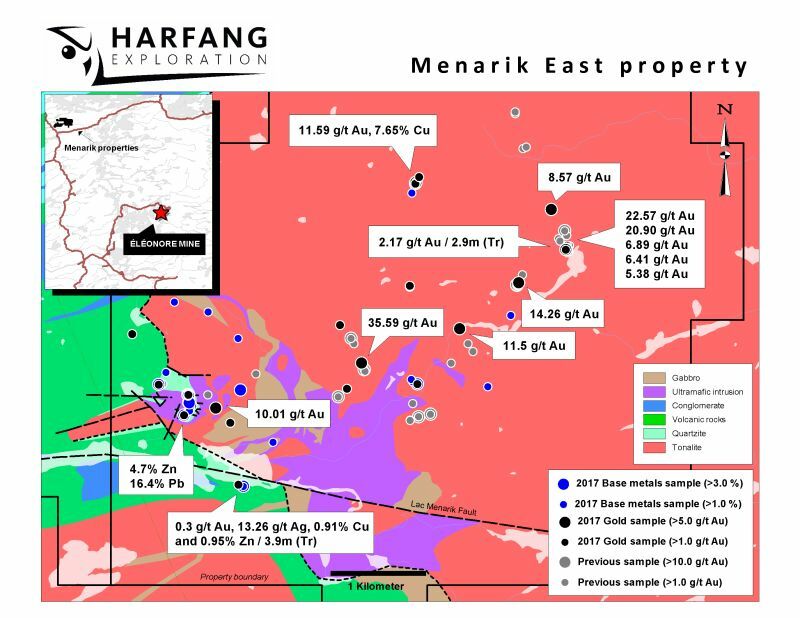 François Goulet, President and CEO of Harfang Exploration, stated: “The new significant results from the Lake Menarik and Menarik East properties strengthen our confidence in the company’ exploration strategy which consistently lead to new discoveries of gold-rich and base metal-bearing showings. These significant results bode well for the development and future of Harfang”. Rock samples from the property are assayed by standard 30 gram fire-assaying with AA or gravimetric finish at Expert laboratories in Rouyn-Noranda, Québec. Some samples are also analysed for base metals, using AAT-7 or AAT-8 digestion method. Exploration program design, Quality Assurance/Quality interpretation of results is performed by qualified persons employing a Quality Assurance/Quality Control program consistent with the industry best practices. Standards are included with every 20 samples for Quality Assurance/Quality Control purposes by the Corporation as well as the lab. This press release has been prepared by François Goulet, P.Geo., President and CEO, a “qualified person” as defined by NI 43-101. For further information, please consult Harfang’s website: www.harfangexploration.com.